As expected, Square Enix today revealed the much-anticipated Shadow of the Tomb Raider game along with its full action-packed trailer and tons of high-resolution screenshots. 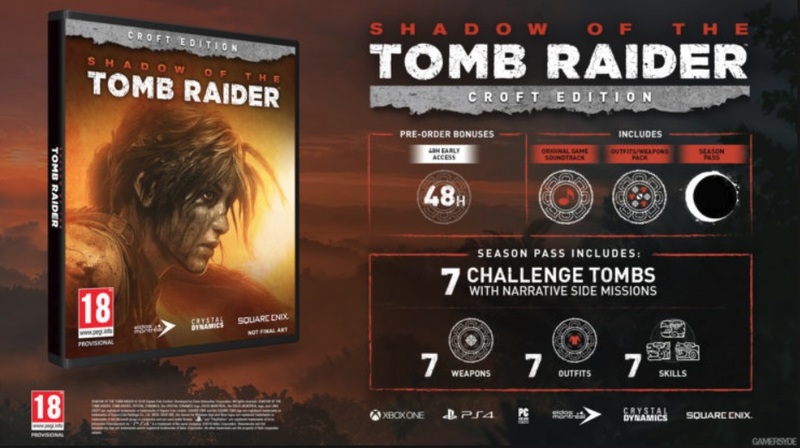 As we were already waiting for the season pass and full edition of the game we now have the full details about Shadow of the Tomb Raider Season Pass and Special Editions. According to the Square Enix listing, Shadow of the Tomb Raider Season Pass will include seven new expansions, co-op missions, and more. Below is the full note from the listing. In our last post, we had already covered what people will be getting with the Shadow of the Tomb Raider Collector’s Edition but now we also have more information about what people will be getting with other editions of the game. The Digital Deluxe Edition includes a weapon and outfit pack and soundtrack, the Croft Edition includes all the Digital Deluxe stuff as well as the Season Pass, and the Ultimate Edition includes all the digital goodies and a Lara Croft statue, flashlight, and bottle opener. Unfortunately, the pricing for the Shadow of the Tomb Raider Season Pass and its various special editions is still not known. But the good news is you can now pre-order the game. Shadow of the Tomb Raider will be available for PC, Xbox One, and PS4 on September 14.